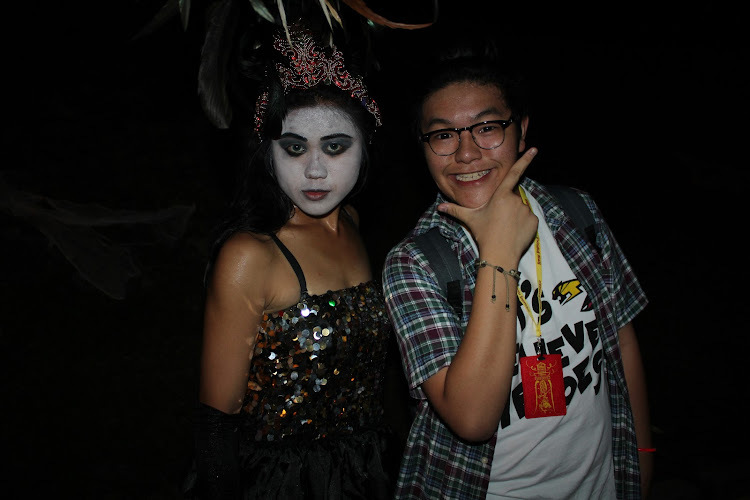 www.uncletehpeng.com : My Experience at Sentosa Spooktacular 2012!! 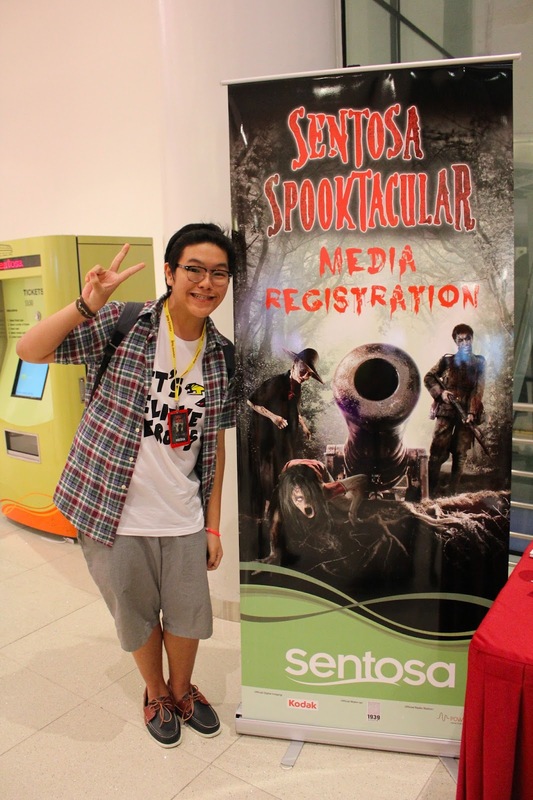 My Experience at Sentosa Spooktacular 2012!! Hi guys! I got invited to attend the media preview of Sentosa's Spooktacular at Fort Siloso! I was able to bring a friend along to the event so I brought Tiffany along with me!! I was afraid to go alone! It's better to be in pairs than alone! In case if some of you guys don't know, I have a bit of phobia that I'm scared of blood! So when I look at it! I will just turn sick instantly, but it's great to have a company to come along with me! Some here are some facts before you want to read the rest of this blogpost. It is the first time Fort Siloso is being used as a Sentosa Spooktacular venue. This is also the first time that Fort Siloso is open at night. It usually closes at 6pm. The average age of our Asian ghosts range from 1 year old to 2,186 years old. This is NOT the USS Halloween Event, this is another Halloween Event located at Fort Siloso. More than 10,000 tickets were sold in Sentosa Spooktacular 2011. There are many different types of stories about how Sentosa got this name!! If you would want to take your time to read! Some said this island was once an island of the dead with graveyards and cemeteries. Sentosa was pirate-infested and bore stories of epic battles between local inhabitants and pirates. In the end, the pirates won the fight and dominated this island, making it their lair and stronghold. The past was filled with gruesome murder, thus attributing to the name Pulau Blakang Mati. The island was the material paradise of warrior spirits buried at Pulau Brani, and hence the island got its name, Pulau Blakang Mati. In the late 1840s there was an outbreak of disease (Blakang Mati Fever)on the island in the late 1840s almost wiped out the original Bugis settlers on the island. Met up with Noelle and her friend, John! We decided to stick together during the whole event!! On the train on the way to Beach Station! Tiffany and Noelle looks excited too! Hehehe! This is how the entrance looks like! Okay is it me or the image of the ghost at the side looks abit realistic? Before we really get into it, here are some history background about Fort Siloso if you are really clueless about it. The Fort Siloso was built in the early 1880s to aid in protecting the port. It was part of Singapore's coastal defence along with Fort Serapong and Fort Connaught in Blakang Mati, as Sentosa was then called. Fort Siloso was a coast artillery battery, one of twelve coast artillery batteries which made up ‘Fortress Singapore’ at the start of World War Two. The forts were built to defend the land against sea invasion from the south. During World War II, the Fort's guns were turned 180 degrees inland to defend against land invasion by the Japanese Army in the west. The Fort's guns were fired at Japanese positions and troops who were advancing toward the city from Tengah Airfield. Fort Siloso continued to serve the Japanese as a Prisoners Of War Camp until the end of the war. British and Australian soldiers captured by the Japanese were thrown into the prison and tortured. About 300 staff in total are involved in the making of Sentosa Spooktacular, humans and non. There are 450 skeletons and skulls involved in Sentosa Spooktacular 2012. The number of ghosts residing at Fort Siloso this year totals to about 200. The Pontianak, Ghost Bride, Dead Soilder, Jiang Shi (Chinese Vampire) and many more!!! Okay! Let's proceed with the photos and let's start exploring Fort Siliso! Was greeted by this chinese ghost holding something that looks like a broom stick. Hahah this ghost has braces! Wow!!! Can you see the Chinese talisman? Another one featuring the skeleton on the ground! British soilders!! Hahaha! They go around screaming at people! Mmhmm! This ghost is so interesting! Love the outfit! I don't know what ghost is this..
A tree decorated with skull heads! Looks creepy! This ghost is soooo adorable! HAHAHA! He looks like the miniature version of Hulk! They only come out at night hunting for food! This lady ghost just suffered a miscarriage!! We explored the first trail, The Land Of The Lost Souls! We somehow entered into an Airplane! Pretty uh?! 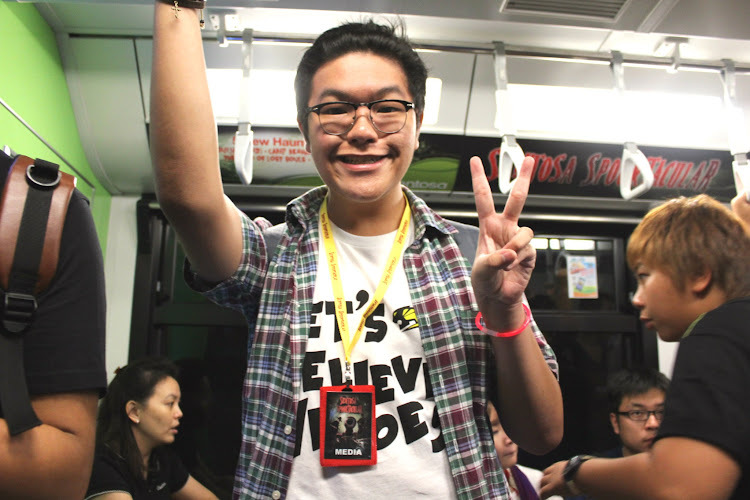 :) "sawadee ka, welcome aboard to our airline!! " Another air stewardess at your service! This way please .... and I got surprised by this ghost trying to grab me! HAHAHA!! After this we had to go up the staircase!! 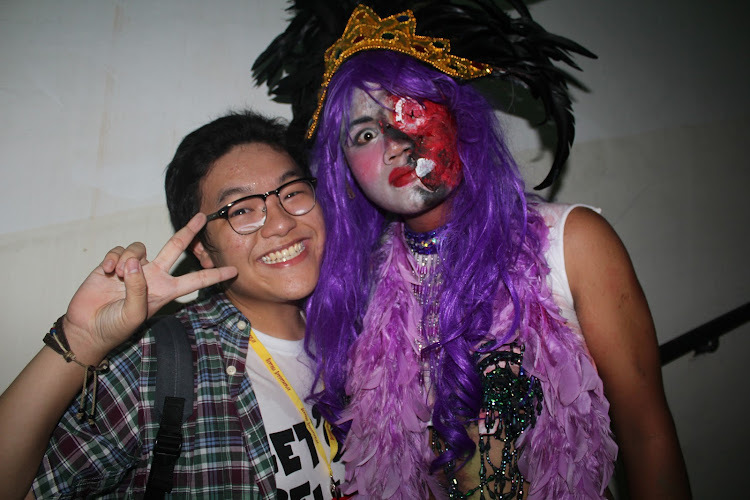 Photo with Thai Ladyboy ghost!! HAHAHAHA! BEWARE OF LOOSE "WOMEN"!! Attempting to eat this piece of brain!! My favourite picture of the night!! That's the end of the first trail!! It looks like a long process right that's why you definitely have to come to Spooktacular 2012! Chinese ghost all chained up! Have you seen my boyfriend? Next trail is the Deadly Doll Studio!! Welcome to the world of mirrors. HAHAHA this solider posing while I hold his rifle! I'm going to end here! Because I don't wanna become a big mega spoiler! I only featured 2 trails in my blogpost! There are 3 other more! For that you have to find out yourself! Come down to Fort Siloso and enjoy the spooks! Make sure to bring your cameras! More details below! *Please note that at the Camp Berhantu trail, only the first 100 pax will enjoy the interactive part of the trail (i.e. the laser tag). The rest of the guests will go through the trail without the laser tag guns. SO WHAT ARE YOU WAITING FOR! COME DOWN TO FORT SILOSO, SPOOKTACULAR WITH YOUR FRIENDS OR FAMILY MEMBERS!! Had so much fun with Tiffany, Noelle and John!!! ^.^ Many thanks to Omy for the invite!!! See ya! !